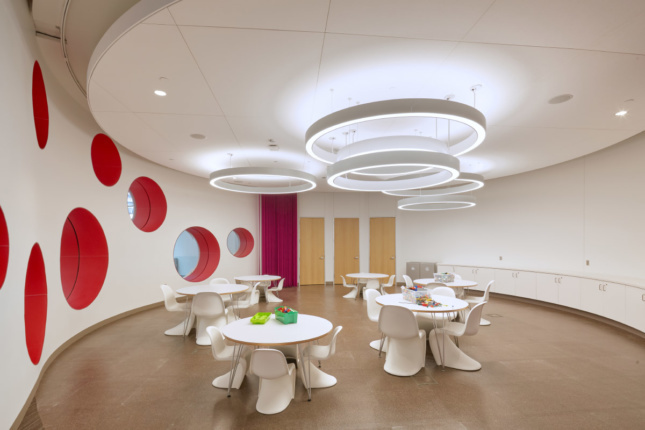 Austin’s new Central Public Library, designed by Lake|Flato with Shepley Bulfinch, opened last October. The 198,000-square-foot facility occupies a full city block adjacent to where Shoal Creek meets the Colorado River in the western part of downtown. Austin’s first residents settled here 180 years ago, and in the 20th-century municipal facilities like the Seaholm Power Plant were built nearby. Planning for the library began in 2009 as part of the district redevelopment surrounding the repurposed power plant. After some delays, the library, with a $125 million price tag, arrives as a major addition to downtown’s cultural landscape. In Austin, the new library doubles the book capacity of the previous central library, but books are not the focus of the architecture. For years, the library typology has been morphing into a more generic public space that supports a range of studious and social actions. 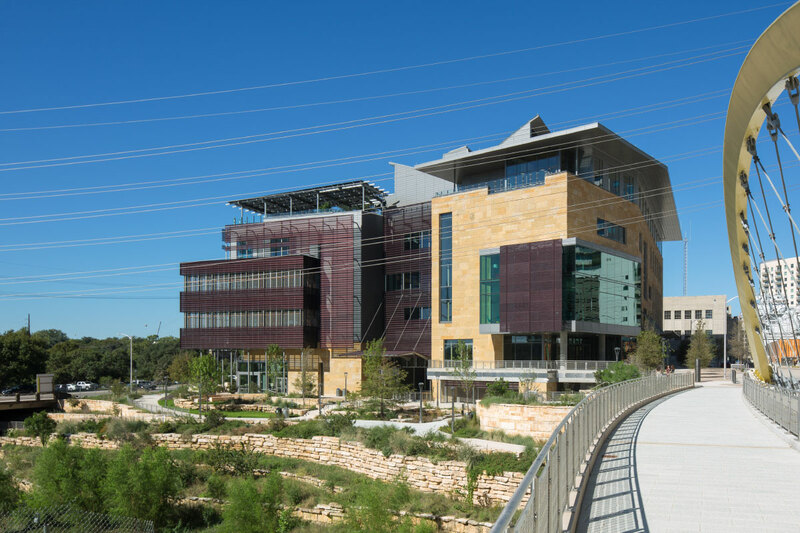 Austin’s new Central Public Library, the city’s fourth, is an example of the library as urban amenity. Here, event takes precedence over edifice. As such, its traditional library aspects shrink while its public aspects sing. The library anchors a new district of Austin. Nearby, condominium and office towers race upward on either side of Shoal Creek; most of the neighborhood is recently completed or still under construction. The Green Water Treatment Plant Redevelopment itself will create 1.7 million square feet of leasable space. Next door, the former Seaholm Power Plant has been converted into offices for tech start-ups. One block north, the Independent, a Jenga-style residential tower similar in scheme to New York’s New Museum and now under construction, will rise 58 stories. An electrical substation, unable to be relocated, is screened by the “Power Picket,” a colored concrete post fence designed by NADAAA. Outside the library, a new bridge across Shoal Creek connects to the pedestrian-friendly areas of the 2nd Street District, itself developed just a decade ago, turning an underused set of city-owned blocks into a retail destination and the relocated home of Austin City Limits. The creek’s edge next to the library has been improved into a generously wide promenade. 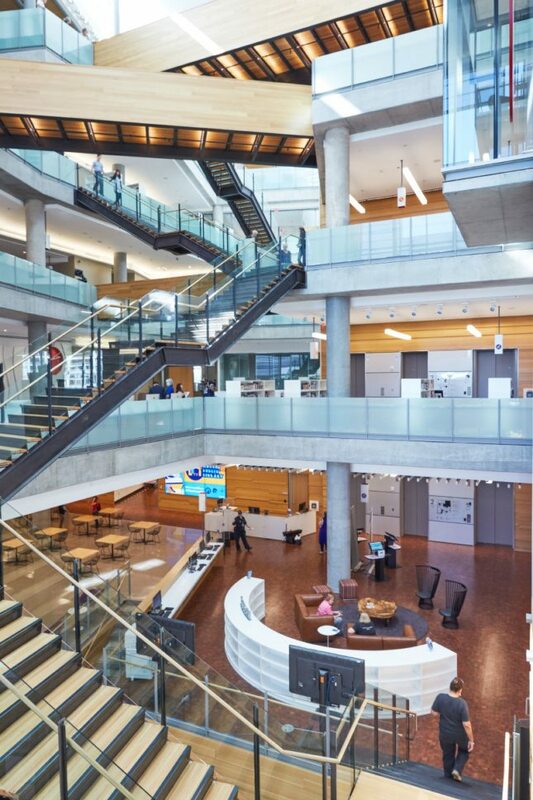 The library’s public energy starts here, as Austinites— ambling about the newest parts of their city or arriving from the airy parking garage below—are swept up into the expansive interior. This atrium is the most powerful space in the library. Atop the overhanging roof, a two-sided skylight with the profile of a cowboy hat directs sunlight deep into the interior, ensuring each floor is well lit. 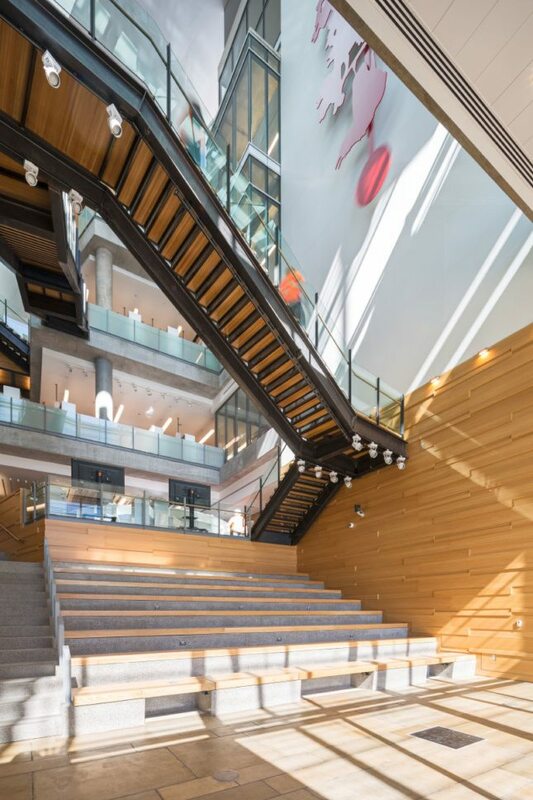 Every floor opens to the atrium—meeting rooms overlook it, wooden pathways span across it, and lighter stairs switchback upward on its edges. Its spectacle, part cavernous natural feature, corporate headquarters, and mall concourse, invites visitors to hike the trail rather than take the elevator. Upstairs, a variety of overlooks yield new urban vistas: To the north and east the rapidly changing skyline, to the south Lady Bird Lake, and to the west the beginnings of the Texas Hill Country. Lake|Flato are masters of the porch and have lifted this expertise into the sky, locating a series of outdoor spaces complete with hog wire enclosures and wood soffits on different levels. While the atrium is lively and loud, these spaces are pleasantly quiet. An eastern roof terrace concludes the trek with open-air views of downtown. 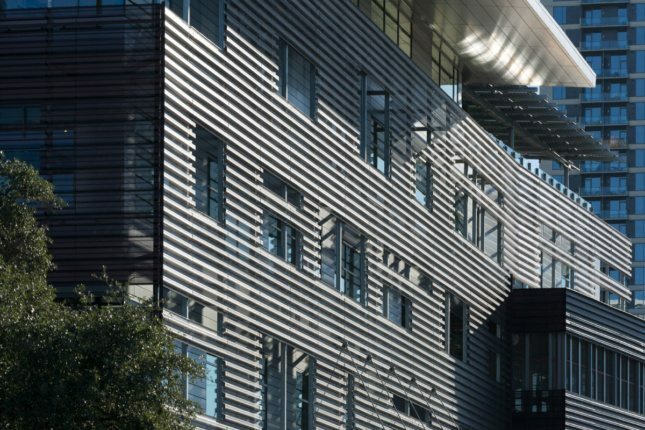 The exterior, clad in tan limestone and gray metal panels, is the least successful part of the library. Corrugated profiles of rust-colored perforated metal stand off the southern facade and screen glazed areas elsewhere. Looking up, it is a busy assembly whose articulation is sourced from Austin’s contemporary vernacular, a language that Lake|Flato established and refined over the last thirty years. The library is one of the firm’s tallest projects, and perhaps that is part of the difficulty: Translating a style that works for low-lying buildings engaged with their landscape into a vertical urban condition is a significant design challenge. Inside, the atrium and central core break up the floor plates into a ring with interior stacks and seating on both perimeters. The verticality of the scheme promotes visual adjacency rather than physical togetherness. Throughout, the architecture creates comfortable vantage points, whose cumulative result is a casual publicness generated by all of the ways to see across and out of the building. The achievement and difficulty of this library is that its interior unfolds in a uniform topology of amenity space. The interior, shaped by its meeting rooms and furniture selections, feels more like the trays of a tech office or a co-working space than a library. In a familiar rupture of form and function, the architecture is decent in its design, while powerful in experience. The building is a constructed chakra of Austin’s energy right now, vortexed into being from the frenzy of development at work in the city. It feels like the karstic landscape and the accepted way of building upon it is peeled up and knotted into a bowline of pure Austin-ness. The library succeeds when one navigates it as a civic terrain—inside and out—and not explicitly as a distinct piece of architecture. It is a project that the public will embrace but will, despite its numerous charms, leave some architects wanting more. The central public library provides an image and experience of Austin today. But if this is the city now, where is it going? Outside the library’s buzz, the growing forest of towers, stitched together by creekside paths, offers one speculative way forward. Austin’s new Central Public Library will serve its publics for decades to come, as the city grows up around and out from it. If, as one Texan argued in The New Yorker last year, America’s future can be seen in the challenges of the Lone Star state, then what happens here takes on even greater meaning. What should this future look like? The eyes of Texas are beginning to see.